We offer implant dentistry which is an alternative to dentures. Russell Hamarnah, DMD, offers implant dentistry in Orlando. Dental implants are a permanent alternative to dentures. They are surgically placed in your jawbone, allowing you to have natural-looking teeth that look, feel, and function just like your natural teeth. Without your natural tooth structure within the jawbone, bone loss inevitably follows. The jawbone actually shrinks, creating a sunken appearance. Being able to maintain your natural chewing function also prevents bone loss. While the aesthetics of implant dentistry are part of the appeal of dental implants, the preservation of jawbone and chewing function is of utmost importance. Who is a Good Candidate for Implant Dentistry in Orlando? If you are missing teeth, consider seeing an implant dentist. 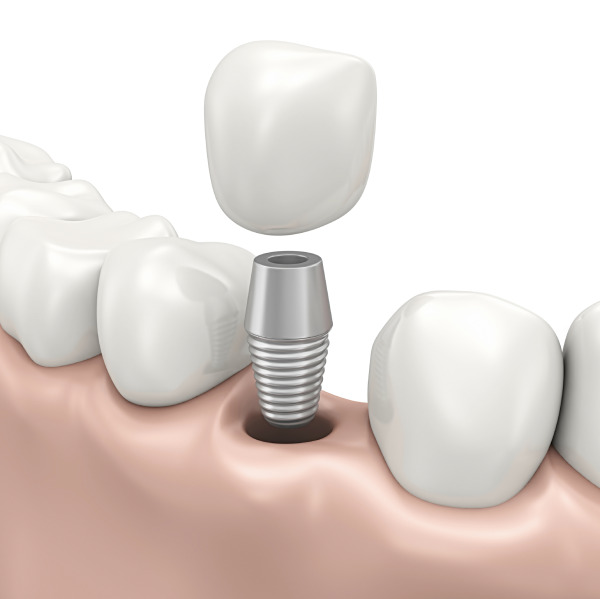 In general, dental implants are ideal for patients who a re missing some or all of their teeth as well as for patients facing the prospect of losing their teeth to disease. In fact, Dr. Hamarnah highly recommends dental implants as the first choice for patients' that are missing teeth or need to have a tooth extracted. Dental implants are the best solution. They are a long-lasting, permanent solution. In addition to their natural appearance and their ability to preserve bone and chewing function, dental implants deliver other important benefits. Because dental implants are secured to the bone, there are no dietary restrictions as there are with dentures. Caring for dental implants is similar to caring for natural teeth. There's no messy adhesives to deal with, and no worries about your teeth slipping out of position. In fact, no one needs to know that you have implants. Dental implants can improve your self-esteem, too. Implant dentistry involves scheduling an appointment with an implant dentist. From there, 3D digital images of your mouth and computer guided software guide the dentist as he plans your treatment. The implants will be surgically placed in your jaw at our Orlando implant dentistry office and then topped with custom, natural-looking crowns. Are you ready for a permanent solution to missing teeth? Schedule an appointment with an Orlando implant dentist today.